ROME — The foundation stone of St. Patrick’s Church in the Eternal City was laid during a critical period of Irish history and the eve of a low-point in the country’s relationship with the Vatican. I stopped by the church, plain by Roman standards, as part of my ongoing project of visiting as many St. Patricks as possible. As it turned out, the church’s foundation date of 1 February 1888 (St. Brigid’s Day) also dovetailed with my interest in Ireland’s late 19th century nationalist struggles and land war. 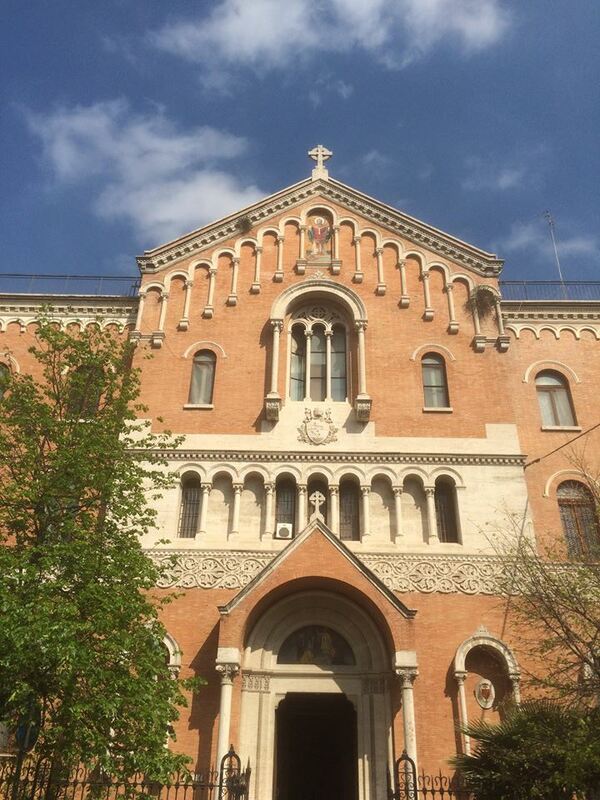 St. Patrick’s Church, Rome, April 2017. Mosaic of St. Patrick below Celtic cross. The morning of the foundation ceremony, a delegation of three archbishops, 10 bishops and 300 other pilgrims from Ireland, America and other nations with significant Irish immigrant populations met with Pope Leo XIII. The visitors gave the pope “a magnificent chalice of Irish workmanship,” a photo album of “sights, churches and principal monuments” of Dublin and a nearly £16,000 donation to the Vatican exchequer. The pontiff blessed the trowel to be used in that afternoon’s building site ceremony and handed each of the guests a coin commemorating the 50th anniversary of his priestly ordination. The pope addressed the group in Latin, according to The Nation, which reproduced his text with an English translation. He assured the visitors that he had viewed Ireland “with paternal care” since the start of his pontificate 10 years earlier. “We were moved by her many claims upon us, but most of all by the integrity of that Catholic faith which, established by the labors and the zeal of St. Patrick, was preserved by the unconquerable fortitude of your ancestors, and transmitted to you to be guarded as a sacred inheritance,” he said. 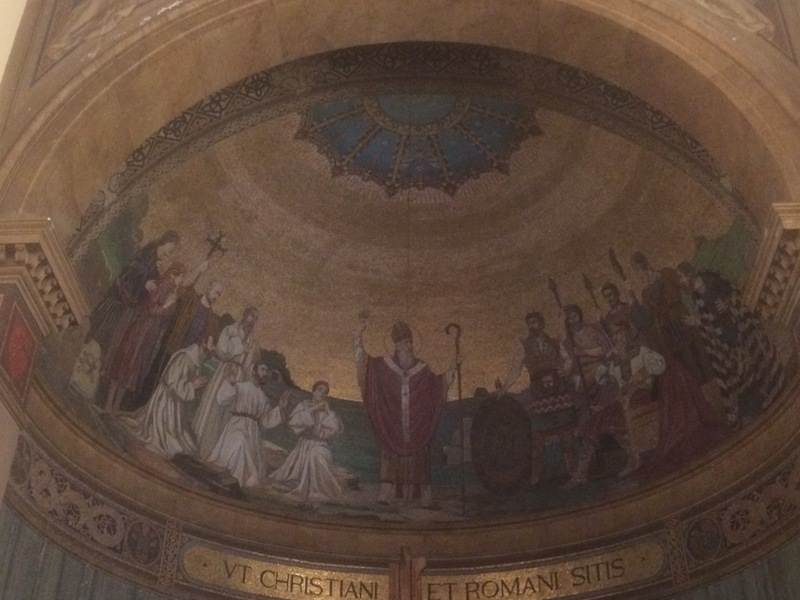 The mosaic above the sanctuary is by Rodolfo Villani and depicts St. Patrick converting the High King Laoghaire at Tara, using the shamrock to explain the Trinity. The banner UT CHRISTIANI ITA ET ROMANI SITIS (“Be ye Christians as those of the Roman Church”) — is from the writings of St. Patrick. The pontiff also briefly discussed the “present state of affairs” in Ireland, noting that a year earlier he dispatched Archbishop Ignatius Persico to investigate the country’s troubles. At the time, tension between Irish tenant farmers and absentee landlords had been stoked by a protest strategy known as the Plan of Campaign, which sought to reduce rents by withholding payments. If tenants got evicted, the Plan called for peer-enforced social ostracism, or boycotting, to prevent others from leasing the land. Some Catholic clergy were tacitly supporting the movement by joining the simultaneous nationalist efforts to secure Irish political autonomy, called home rule. As if to underscore the troubles in Ireland, boycotted Kerry farmer James Fitzmaurice was gunned down in a widely reported land-related murder a day before the February 1888 foundation ceremony. That may have been on the pope’s mind when he told the Irish delegation he ordered the Persico mission “that we may be aided by his report in ascertaining the actual condition of things, and the steps that in your interest it may be desirable to take.” The pontiff also suggested that he might help ease Ireland’s “difficulties” through his personal diplomacy, just as he diffused anti-Catholic tensions in Germany. Back in Ireland, however, The Nation noted that there were “wide differences” between the situations in the two countries, and that a similar outcome was unlikely. “The German question was essentially a religious one; the Irish question is an essentially non-religious one. Nor is there in English politics any such commanding personage as Bismarck,” the paper wrote four days later. Sanctuary statue of St. Patrick. 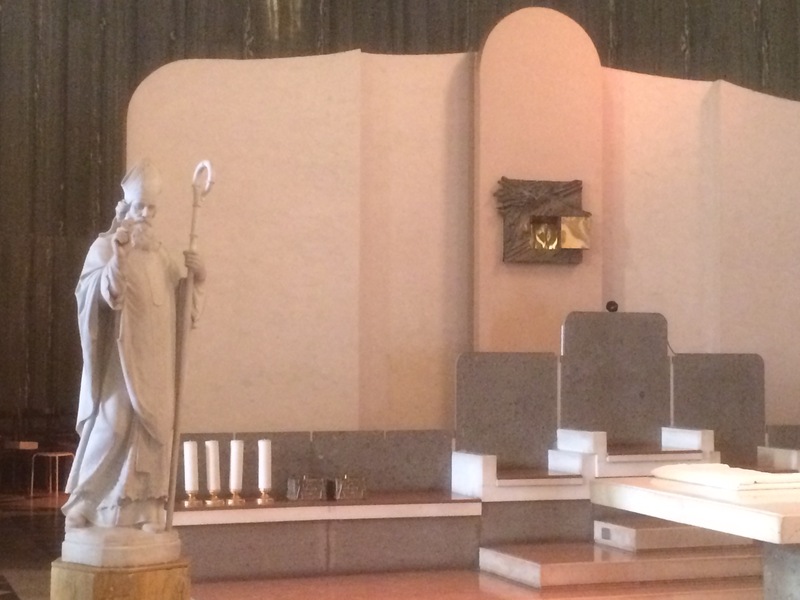 The tabernacle is open because this photo was taken the morning of the Easter Vigil. The Irish bishops grumbled that the decree divided their loyalty to the pope with their ministry to the people. The directive also drew a harsh rebuke in the first issue of The Irish Catholic, the latest publishing endeavor of Timothy Daniel Sullivan, a Dublin-based MP who also owned The Nation. “We deplore that the Holy Office has been deceived into accepting as a description of the affairs of Ireland, one without any basis in fact,” the new weekly said in its 5 May editorial. Two months later, Rome reinforced the rescript with a Papal Encyclical, Saepe Nos, which complained the original decree was “grievously perverted by means of forced interpretations.” The pontiff reminded his Irish readers that he had “carefully inquired” to “obtain full and reliable knowledge of the state of your affairs, and of the causes of popular discontent.” In other words, the Vatican was standing by its original orders against boycotting and the Plan. The Irish hierarchy and populace only grew further enraged. By the end of 1888, 28 of 30 Irish bishops signed a letter to the pope stating that they could not enforce the decree without jeopardizing both his and their own authority in Ireland. The following year became “perhaps the worst period in the whole history of Irish relations with the Holy See.” The Irish bishops even balked at Vatican directives to hold special collections to help pay for building St. Patrick’s Church in Rome. Most of Ireland’s tenant-landlord disputes had been resolved by 1911, but an even more difficult revolutionary period was just about to begin. With it, there would be a new round of trouble between Irish nationalists and the Holy See. Freeman’s Journal, 28 March, 1911, page 5. Kerry People, 8 April 1911, page 9. Larkin, Emmet: The Roman Catholic Church in Ireland and the Fall of Parnell, 1888-1891 University of North Carolina Press, Chapel Hill, 1979. “Worst period” quote on page 3, plus other background. The Nation, 4 February 1888, page 11. This entry was posted in History, Irish America, Politics, Religion and tagged Archbishop Ignatius Persico t, boycotting, Charles Stewart Parnell, Land War, Pope Leo XIII, Vatican on April 23, 2017 by admin.